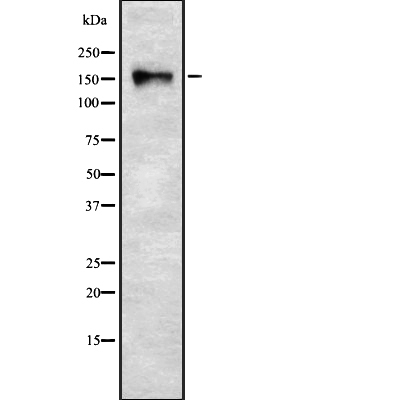 Small volumes of anti-RSF1 antibody vial(s) may occasionally become entrapped in the seal of the product vial during shipment and storage. If necessary, briefly centrifuge the vial on a tabletop centrifuge to dislodge any liquid in the container`s cap. Certain products may require to ship with dry ice and additional dry ice fee may apply. Function: Required for assembly of regular nucleosome arrays by the RSF chromatin-remodeling complex (PubMed:12972596). Facilitates transcription of hepatitis B virus (HBV) genes by the pX transcription activator. In case of infection by HBV, together with pX, it represses TNF-alpha induced NF-kappa-B transcription activation. Represses transcription when artificially recruited to chromatin by fusion to a heterogeneous DNA binding domain (PubMed:11944984, PubMed:11788598). Subunit Structure: Interacts with SMARCA5/SNF2H to form the RSF complex (PubMed:12972596). Identified in a centromere complex containing histones H2A, H2B and H4, and at least CENPA, CENPB, CENPC, CENPT, CENPN, HJURP, SUPT16H, SSRP1 and RSF1 (PubMed:27499292). Also binds the HBV pX/HBx protein, which is required to activate transcription of the viral genome (PubMed:11944984, PubMed:11788598). NCBI/Uniprot data below describe general gene information for RSF1. It may not necessarily be applicable to this product. Required for assembly of regular nucleosome arrays by the RSF chromatin-remodeling complex (PubMed:12972596). Facilitates transcription of hepatitis B virus (HBV) genes by the pX transcription activator. In case of infection by HBV, together with pX, it represses TNF-alpha induced NF-kappa-B transcription activation. Represses transcription when artificially recruited to chromatin by fusion to a heterogeneous DNA binding domain (PubMed:11944984, PubMed:11788598). 1. Remodeling and spacing factor 1 (RSF1) stability is regulated at the post-translational level upon DNA damage.